Recombinant fragment, corresponding to a region within amino acids 250-537 of Human CPNE1 (UniProt ID: Q99829). 293T, A431, H1299, HeLaS3, HepG2, MOLT4, Raji and Mouse brain whole cell lysates; Human Cal27 xenograft tissue. Our Abpromise guarantee covers the use of ab155675 in the following tested applications. May function in membrane trafficking. 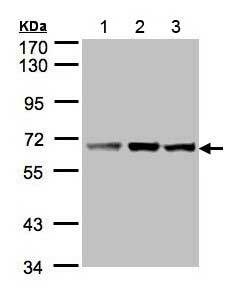 Exhibits calcium-dependent phospholipid binding properties. Belongs to the copine family. 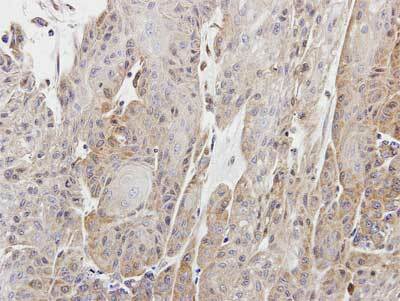 Immunohistochemical analysis of paraffin-embedded Human Cal27 xenograft tissue labeling CPNE1 with ab155675 at 1/100 dilution. Publishing research using ab155675? Please let us know so that we can cite the reference in this datasheet. There are currently no Customer reviews or Questions for ab155675.